Down From Ten is now available in ebook and paperback formats, with new cover art and a new author’s note, from AWP Fiction. I’ve been waiting for this day a long time. When I first wrote Down From Ten as a screenplay, a production company in Canada was going to be handling rights clearances for the Alan Jay Lerner music incorporated into one of the scenes. When I did the podcast, ASCAP was very helpful. But as a print book, I had to wade into a rights clearance arena I’d never worked with before. It was worth it. And the folks at the company that manages the Lerner estate were very helpful. 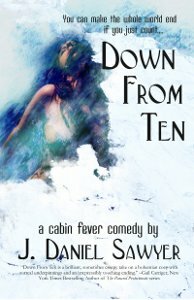 Because of their kind work, I can now proudly present you with the ebook version of Down From Ten, a novel uniquely close to my heart. In early January, a group of friends gather for an annual retreat: eight artists, scientists, and authors cloistered together in a mansion in California’s high country for ten days of games, conversation, exhibition, and hedonism while isolated from the outside world. The biggest Sierra snowstorm in over twenty years, however, is not part of their plans. When the house is buried in an avalanche, leaving our heroes with no way to hike out, they must somehow survive and stay sane while waiting for rescue—which becomes difficult when they all start having the same dream. Get it now in paperback, or for your Kindle, Nook, or any other reader. Or, read the first three chapters here. Due to some unforeseen production hiccups, some involving my own life, some with lives of our rockin’ cast members, DF10 isn’t finished yet and there hasn’t been an episode in seven weeks. This situation is now about to change. In my hot little hands are two near-complete episodes – 19 and 20. 19 will drop tonight. 20 will drop either Friday or Saturday. If all goes well, I’ll be able to drop two more episodes next week, and then the final 3 the week after. My many apologies for the delays – I hope the story turns out to be worth the wait! This is the official page of Down From Ten, a country house mystery by J. Daniel Sawyer. This project started life as a miniseries written on commission from the now-defunct Pixelated Fog Productions in Newfoundland. Originally part of a financing grant, the rights reverted to me when the deal fell apart and the nascent company was forced to fold. The story itself grew out of a treatment I wrote a couple years back, which PFP picked out of a group I offered them. Their directions were : Make it controversial. So I did. The book is a mix of Agatha Christie, Gabriel Garcia Marquez, E.A. Poe, Salman Rushdie, and Robert A. Heinlein. It is a story solidly oriented towards adults, and will not be suitable for children in any fashion. Although I would still love to make this project into a film, I realized that it would be a fairly quick task to adapt a 6 hour miniseries to a book for podcasting, to fill the summer between books one and two of The Antithesis Progression. Adapting it turned out to be more difficult than I thought – nonetheless, I’m currently on schedule to start release Memorial Day Weekend. Like my previous podio endeavors, this production will feature a full cast performance, original music, and soundscaping.